Looking across the landscape in Writing on Stone Provincial Park in Southern Alberta, Hoodoos extend along the banks of the Milk River. 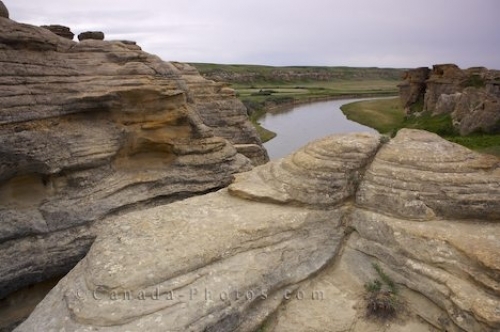 The Hoodoos Interpretive Trail is a fascinating place to see these unique rock formations and view the beauty of the Milk River that flows amongst them. Milk River seen from the Hoodoos along the Hoodoos Interpretive Trail in Writing on Stone Provincial Park, Southern Alberta, Alberta, Canada. Picture of the Milk River as it makes it way through the Hoodoos in Writing on Stone Provincial Park in Southern Alberta.